Say cheese. Ellen DeGeneres’ hidden camera stunts have long been a hallmark of the show, but they took a deliciously awkward turn when one audience member was caught stealing. 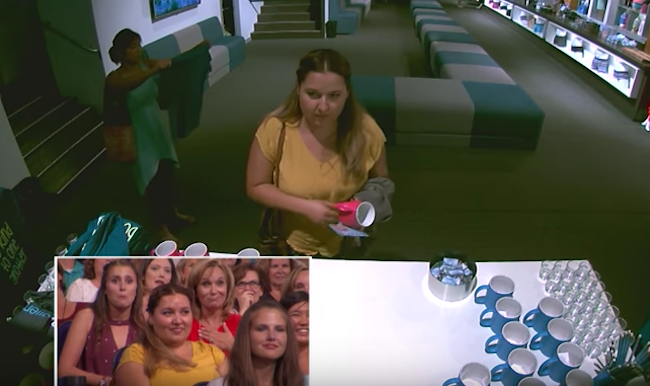 To mark the show’s 14th season, DeGeneres went full-blown Oprah and decided to have a giveaway for audience members, telling everyone they could each take one free gift from the gift shop. Since there was no security watching over the shop, people could take more than just one and get away scot-free — or so they thought. “I just wanted to see how honest my audience was,” DeGeneres says. One audience member was commended for paying for another item that she wanted, rather than simply stealing it. And then there’s Nancy. Oh, Nancy. Goddamit it, Nancy. In the hidden video footage, Nancy’s friends inquire if she’s taking “more stuff”and Nancy says, “Shhh. No, Shut up,” pilfering numerous souvenirs. Ellen decided to make life intensely awkward for all of us by airing the undercover footage catching Nancy in the act of cat burgling. Of course, no one felt more awkward than Nancy. Oh, Nancy. Goddamit it, Nancy. “I like that you liked the products so much that you wanted to bring one back for your sister,” Ellen tells a cowering Nancy. Then she had Nancy removed from her seat. “Let that be a lesson to you,” DeGeneres crowed. I hate a thief too but what was the purpose of the set up? Too much shrinkage of her crappy merchandise she hocks? Man, she got off easy. I hate people who lie and steal. I mean she’ll be humiliated when she gets home. But you can tell this woman has no shame. I think because it was a set up, Ellen was gentle about it. It’s not like she did a smash and grab or backed her suv up to the back door. But I think Ellen is a mean spirited wolf in lamb’s clothing. She preaches kindness but is pretty mean to people and because she’s rich and powerful they let her do it. I hear she and Portia are REALLY getting a divorce. Now that the show is on hiatus for the summer…,how sneaky, ellen. Because she said if they ever divorced she would be the first to ANNOUNCE IT ON HER SHOW. The lesbian scene is pretty incestuous in Hollywood since Jodie gets Ellen cast offs and so on. Or maybe Ellen gets Jodie’s castoffs. Maybe Portia got tired of the hidden cameras and monitors? They need to give you your own gossip column! Portia is probably sick of moving every few years. Ellen buys a house fixes it up and sells it buys another. Portia probably wants a stable home . Totally agree, I’ve been saying for ages the her show has become the Ellen infomercial. She does do good things for the community but the promotion has reached new heights. I cannot believe the rude people commenting all the negative Ellen crap! Not only is she an insanely talented comedian who hosts a successful show where she helps hundreds of people, but Ellen has done more for the LGBT community…the worldwide LGBT community than almost anyone! She gave me the strength to come out, and I consider her my hero! So take your hateful, rude comments somewhere else, stop the jealous gossip and be kind to one another! Welcome to Planet Earth, mortal. Fasten your seat-belt; it’s going to be a bumpy ride. Man, even being generous by allowing those people to take an item away for free, there’s always one that just has to have everything and thinks they can get away with it… I hate thieves. Karma will find their address eventually though, and like Ellen said, she’s the type that would take the whole bowl of candy during halloween. Nancy can shake her head all she wants, but if you’re willing to steal from a shop, chances are, you’re willing to take a whole bowl of candy when you’re only supposed to choose one. Ellen is great. Successful people use their platforms to promote their other projects. It is just common sense. @Scooter 12 .when Ellen came out I couldn’t identify. .she’s a lesbian ..I have nothing in common with a lesbian other than the word gay..had a male TV star come out that’s more relatable /identifiable to me.